Going to the grocery store is something that a lot of people seem to dread, so it’s always good to have some tricks up your sleeve to make it as quick and painless as possible. Having an organized grocery list has been essential to making my trips as efficient as possible. Yes, the easiest way to avoid the grocery store hassle is to just use one of those companies that you can hire to get your groceries such as Shipt, or do the online ordering and go pick it up at the store like Walmart and Kroger have both started. For me personally, I prefer to be able to pick out my groceries. Sometimes I just like the break and excuse to get out of the house. Other times I send Justin to the store. No matter which we do, I always have an organized grocery list. There are a few things to consider when you are organizing your list, and the importance of these will vary based on how you like to shop and which stores you go to most often. One of the biggest things that always helps me is knowing the layout of my grocery store. I hate going somewhere different because I don’t know where to find anything. Once I know the store, I can base my grocery list off the store, and also know where to grab something if I realized I missed it later in the trip. For example, we always go to the fresh fruits and produce first, then the cold items, deli/bakery, pantry items, frozen, then non-foods. That’s the way our Neighborhood Walmart is laid out, so that’s how I shop. Now that you know which store you are going to, and know how it is laid out, make your grocery list into categories. Remember how I said my store is laid out? Well, those are my major categories. Across the top of my list, I write a section for Produce, Cold, Frozen, and Non-Foods. Those go on the very top and the items for those categories are listed below. Then on the bottom half of the paper is everything else from the center of the store. This helps me make sure I get all the produce I need while in the produce section and don’t forget any cheese while I am by all the cold foods, etc. There’s nothing worse than getting home from the grocery store and start making your meal for the night and realize you didn’t buy enough of one of your ingredients. Even though you just went to the store, you have to decide to either run back or find a substitute or make a different meal completely. When writing out the grocery list, make sure to write the amount you need for each item. For example, I may be making two meals that require an onion, so I make sure to write 2 next to it on the list. Or if I need heavy cream, I will write 16oz or 24oz or whatever the amount so I know I get enough, but not more than we need either so the food isn’t wasted. On the back of my grocery list, I usually write out which meals we are making that week. There have been times that I am at the store, and they are out of something I have on my list. I refer to the list of meals to see what else I can get to substitute in that dinner. In the past, I didn’t write that down and would have trouble remembering what meals I was planning to make. It also is helpful because then you can also decide which side dishes to make with a meal while you are at the store if you know what the meals are. Well hopefully this helps then! This is so smart! I seriously need help in this department. I find myself scraping for an old receipt and scribbling a quick to go list before running in the market and coming home to forget several items! Your tips will help me be better organized!!! I used to do the same and found we were spending so much more because every time I would go I’d grab stuff we may not need. Making a full list has helped in so many ways! I love breaking my shopping list up by aisle / area in the store! It makes it so much less confusing! Yes! And it really helps from backtracking for forgotten items too. When we go shopping together, my husband is in charge of the cart (and the kids if they aren’t in school) and I do the list. I just grab as we walk and put it in the cart. 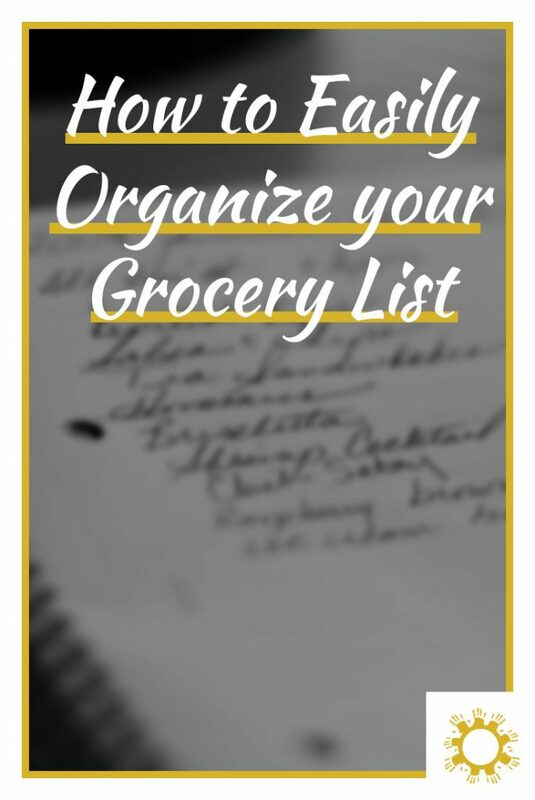 My family always struggle when it comes to organize the grocery list and i think you got a great tips on how to do it. It’s really helpful when we have a organized grocery list! It took me a while to figure out what works best for us. But organizing the list makes the grocery trip so much quicker! I desperately need to make a more organized grocery list. Mine is so crazy and unorganized whenever I create one. I wasn’t always organized with mine, but once I started having to bring two kids along, I did whatever I could to help make it a quick and less painful experience for us all. This is why I love Trader Joe’s so much! I can walk through that place with my eyes closed. I know where everything is. Great tips! Lists and organization are so important for productivity. I’ve still never been to a Trader Joe’s, I’ve heard so much about them but never had one close. Glad that I’ve finally found a post like this. These tips will help me out a lot. Thank you so much! That wine will get ya!